You should start with one of the easier types. Most aquarists have their first success with livebearers - guppies, mollies and platies. Egg-layers usually, but not always, take a little preparation. It's well outside of the scope of this article to try to explain how to set breeding tanks up, as this will vary from species to species. 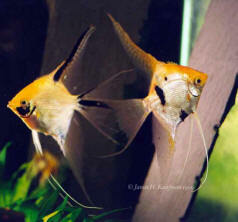 Check the section on individual species, where you will see details on different reproductive strategies used by fish. Livebearers carry their eggs internally and expel fry as they hatch . They'll often turn around and eat their fry. Labyrinth fish often build floating nests of coated air bubbles for their young, who can't swim at the start. Some cichlids lay eggs on various objects and guard the eggs and fry for a few weeks, others keep the eggs in caves, and there is even a large group, the mouthbrooders, who carry their eggs and in some cases their young inside their mouths for safety. It's quite a sight to see Mom open her jaws, and have all her fry flood back into the safety of her mouth! Tetras, barbs and rainbows scatter their eggs and move on, generally. There are exceptions though. "Splash" tetras lay their eggs on leaves just above the surface, and stay under throwing water onto them until they hatch. Fish reproduction is interesting, to say the least.